Despite the many Testimonials offered for the veracity of my own Account of my Life, there are those who are still possessed by Doubt -- either that, no matter how persistent or energetic the Training, a Pig could come to any real Knowledge of Letters -- or, and this is perhaps worse, that the ability to employ them in answering Questions, is any any way a reflection of Intelligence. 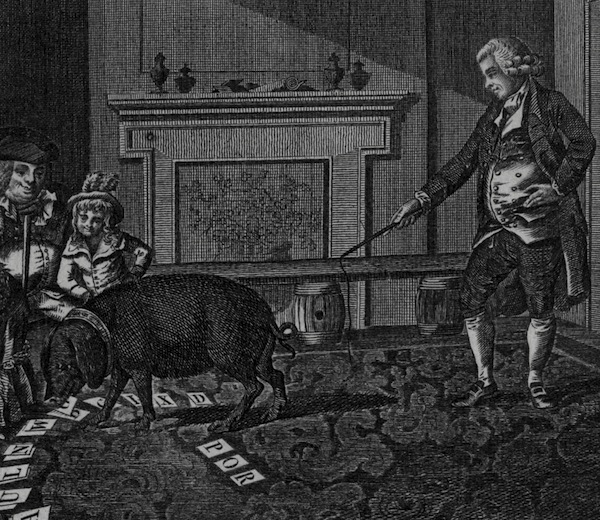 To these latter doubters, who -- no matter how plain the Proofs -- will say that a pig is doing nothing more than responding to invisible Cues from its Master, I can make no other or better Reply than my own Narrative, which is now published and speaks, I believe, for itself. To that other class of doubters, however, I do have a Rejoinder, and indeed it has pleased me to Discover that, among the Natural Scientists of the Twentieth and Twenty-first century, there are many whose estimate of the Capacities of a Pig bear out, in every way, my own Life. Education -- the word comes from the Latin phrase ex ductere, meaning "to lead forth" -- is commonly understood to consist of two Stages: the first being Rote learning, which requires chiefly repetition and Memorization, and the second being Rhetorical learning, which involves the development and utterance of one's own Opinions, and the analysis of those of others. 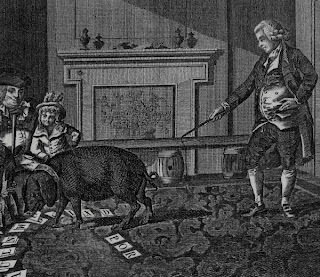 It is fairly easy to grant that a Pig could, as well as any Human child, manage the first of these branches of Education -- and indeed, as my Life testifies, no Violence is required (although some Schoolmasters, such as Dr Johnson's, applied it all the same). It is the second which most Skepticks would point to in doubting that a Pig such as myself could compose his own sentences. The Difference, I should say, between my experience and that of other pigs whose training never got beyond the first stage, was due entirely to my Benefactor Mr Nicholson, in his shewing me how to read on my own from Books. For, when one reads them, one is inevitably imbued, by slow degrees, with the pattern and variety of Sentences within, and it is from these Patterns that new ones must be constructed. All humans enjoy the conceit that their Utterances are Novel, for so they seem to Them, but the Lumber-yard from which their words are drawn, as well as the many old Saws which are employed to shape it, are indeed the Commonest of things, and any one who speaks the Language knows them. Had I not read such volumes as Johnson's Rasselas or Smollett's Peregrine Pickle, I should hardly have been able to write my own, at least not in a way that would meet my Readers' understanding of what a Narrative should be. Aha! cry the Skepticks -- you are naught but an Imitator! Indeed I am, but so is any one who has ever Written. The seeming novelty of most books derives, not from their utter departure from what has been said before, but by the placing of the elements of earlier tales in new and surprising Arrangements. And so it was with me. A Writer must be first a Reader, and that there are not, on every shelf, a Plethora of Porcine autobiographies, I can attribute to the simple fact that no Pig besides myself was ever given a book of its own.